Up until now the best first-party Nintendo game on the 3DS was a remake of a 13-year-old Zelda game. If anyone can steal Link's place at the top of the charts, it's a fat Italian plumber. Super Mario 3D Land is almost here, an amalgamation of decades of Mario fun in one tiny package, ready for Nintendo fans to turn the 3D slider up to 11. Combining the side-scrolling of early Mario games with the free-roaming 3D of titles like Super Mario 64, this is the Sonic Unleashed of Mario titles, only he doesn't turn into a werewolf...wait, does a were-raccoon count? While I puzzle over the potential of man / raccoon hybrids (Deviant Art here I come), take a look at what the assembled game reviewers had to say about Mario's first full adventure on Nintendo's newest handheld. Mario is one of the hardest-working men in video games. Whether he's competing in the Olympics or exploring outer space, this gaming icon stays busy. Super Mario 3D Land puts the plumber through his paces with yet another search-and-rescue mission to find a missing princess. Along the way it successfully translates the classic, 2D Mario feel into a 3D setting that feels unique from the series' other 3D releases. Some of the game's other features fall disappointingly short of this creative mark, but you're still left with a fun-filled platformer loaded with content. Super Mario 3D Land bears very little resemblance to the Super Mario Land games that once brought unique and weird ideas to the Game Boy. 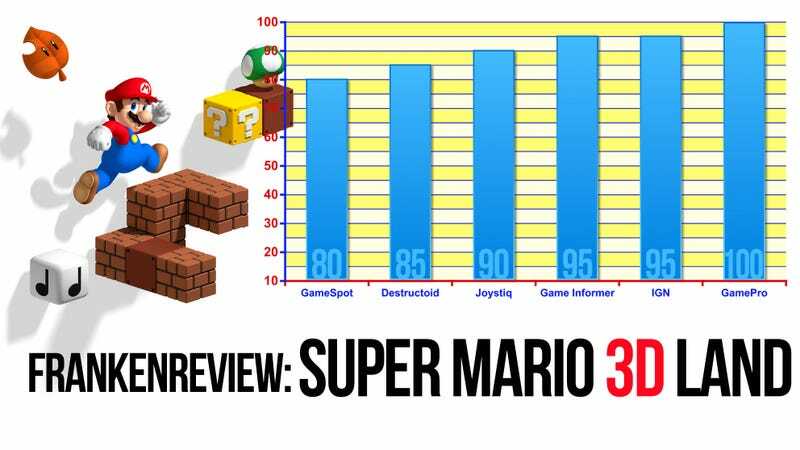 With its 3D perspective, it visually resembles titles like Mario 64 and Super Mario Galaxy, but in many ways, the game feels more like a spiritual successor to Super Mario Bros. 3 than any other established title. It's not just because the Tanooki Suit has made its welcome return. The game features many levels inspired by the NES classic, including a variety of airship boss stages in which players must duck and weave through familiar fire traps and Bullet Bill cannons. Furthermore, Boom Boom has returned as a recurring boss fight after debuting in Super Mario Bros. 3. There's an almost anachronistic flavor to Super Mario 3D Land, a game that bears the name of a Game Boy series and the visuals of modern games, but features gameplay strikingly similar to a classic NES title. Only Nintendo could pull off such a Frankenstein's Monster of nostalgic platforming and make it work — for indeed Super Mario 3D Land works beautifully. The levels provide a sort of middle ground between the styles of "traditional" Mario and 3D Mario. They're very linear, with a clear path from start to finish, like a side-scroller, but they wind around in three dimensions. Sometimes you're running into the screen, sometimes you're moving upward, and sometimes the screen scrolls diagonally. It's a lot more platforming-oriented, and a lot more "directed" than the usual wide open spaces you expect from a 3D platformer. It's clear that this was designed to be the 3D Mario for people who don't like 3D Mario. The streamlined approach somehow results in levels that aren't as full of secrets as older games — basically each level just hides three Star Medals that you'll really want to hunt for. That means there's less exploration in this game than in almost any other Mario game. What surprises me most about 3D Land is how well the 3D effect is handled. I kept the 3D slider up most of the game, since the levels pop to life with added depth and plenty of effects. Massive spike pillars thrust toward the screen on airships, Mario looks like he's swimming around in a tiny handheld fish tank during underwater scenes, and the heights feel even more staggering when you have to jump off a massive cliff and navigate small platforms on the way to the flagpole far below. Rest your arms on a table to keep the 3D screen in the sweet spot and you won't be disappointed. Nintendo knows how to capture the nostalgia of their franchise, but still temper it with ideas that feel innovative. For every familiar bit of music or a level background that reminds you of Mario games past, you have new abilities to use and deviously designed platforming sections that feel completely unique. And for once, I actually preferred playing a game in 3D. Sure, it's still slightly tiring on my eyes and it significantly cuts down the length of time I can play at a stretch, but the short stages always make you feel like you're making progress, no matter how little time you invest. The tired, princess-saving formula never seems to change, but somehow Nintendo makes every visit to the Mushroom Kingdom feel like the first time. Just when I thought it was safe to go to the bathroom, Mario moves in.